Pluto, shown here in the front of this false-colour image, has a bright ice-covered “heart.” The left, roughly oval lobe is the basin provisionally named Sputnik Planitia. 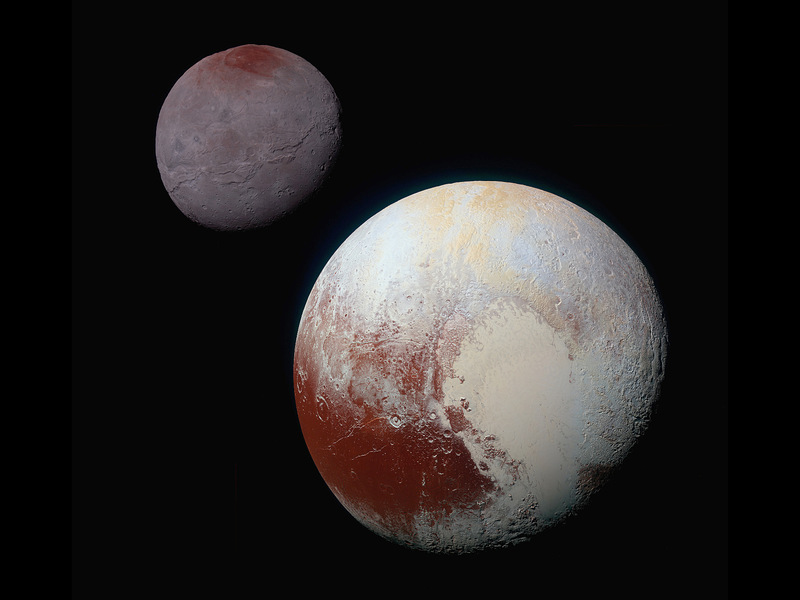 Sputnik Planitia appears directly opposite Charon, Pluto’s tidally-locked moon (back). Click the picture for a detailed view. Image credit: NASA/JHUAPL/SWRI. Pluto’s “icy heart” is a bright, two-lobed feature on its surface that has attracted researchers ever since its discovery by NASA’s New Horizons team in 2015. Of particular interest is the heart’s western lobe, informally named Sputnik Planitia, a deep basin containing three kinds of ices — frozen nitrogen, methane and carbon monoxide — and appearing opposite Charon, Pluto’s tidally locked moon. Sputnik Planitia’s unique attributes have spurred a number of scenarios for its formation, all of which identify the feature as an impact basin, a depression created by a smaller body striking Pluto at extremely high speed. A new study led by Douglas Hamilton, professor of astronomy at the University of Maryland, instead suggests that Sputnik Planitia formed early in Pluto’s history and that its attributes are inevitable consequences of evolutionary processes. The study is published today in the journal Nature. Using a model he developed, Hamilton found that the initial location of Sputnik Planitia could be explained by Pluto’s unusual climate and its spin axis, which is tilted by 120 degrees. For comparison, Earth’s tilt is 23.5 degrees. Modelling the dwarf planet’s temperatures showed that when averaged over Pluto’s 248-year orbit, the 30 degrees north and south latitudes emerged as the coldest places on the dwarf planet, far colder than either pole. Ice would have naturally formed around these latitudes, including at the centre of Sputnik Planitia, which is located at 25 degrees north latitude. Hamilton’s model also showed that a small ice deposit naturally attracts more ices by reflecting away solar light and heat. Temperatures remain low, which attracts more ice and keeps the temperature low, and the cycle repeats. This positive feedback phenomenon, called the runaway albedo effect, would eventually lead to a single dominating ice cap, like the one observed on Pluto. However, Pluto’s basin is significantly larger than the volume of ice it contains today, suggesting that Pluto’s heart has been slowly losing mass over time, almost as if it was wasting away. Even so, the single ice cap represents an enormous weight on Pluto’s surface, enough to shift the dwarf planet’s centre of mass. Pluto’s rotation slowed gradually due to gravitational forces from Charon, just as Earth is slowly losing spin under similar forces from its moon. However, because Charon is so large and so close to Pluto, the process led to Pluto locking one face toward its moon in just a few million years. The large mass of Sputnik Planitia would have had a 50 percent chance of either facing Charon directly or turning as far away from the moon as possible. “It is like a Vegas slot machine with just two states, and Sputnik Planitia ended up in the latter position, centred at 175 degrees longitude,” said Hamilton. It would also be easy for the accumulated ice to create its own basin, simply by pushing down, according to Hamilton. “Pluto’s big heart weighs heavily on the small planet, leading inevitably to depression,” said Hamilton, noting that the same phenomenon happens on Earth: the Greenland Ice Sheet created a basin and pushed down the crust that it rests upon. While Hamilton’s model can explain both the latitude and longitude of Sputnik Planitia, as well as the fact that the ices exist in a basin, several other models were also presented in the 1 December 2016, issue of the journal Nature. In one of those papers, UC Santa Cruz Professor of Earth and Planetary Sciences Francis Nimmo, Hamilton and their co-authors modelled how Sputnik Planitia may have formed if its basin was caused by an impact, such as the one that created Charon. Their results showed that the basin may have formed after Pluto slowed its rotation, migrating only slightly to its present location. If this late formation scenario proves correct, the properties of Sputnik Planitia may hint at the presence of a subsurface ocean on Pluto. Although Pluto was stripped of its status as a planet, an ice cap is a surprisingly Earth-like property. In fact, Pluto is only the third body — Earth and Mars being the others — known to possess an ice cap. 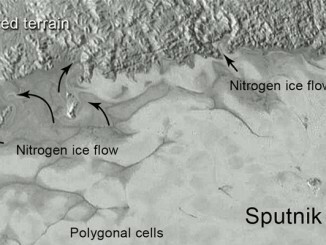 The ices of Sputnik Planitia may, therefore, offer hints relevant to more familiar ices here on Earth. Earlier this year scientists presented evidence for Planet Nine, a Neptune-mass planet in an elliptical orbit 10 times farther from our Sun than Pluto. 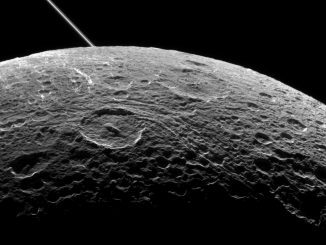 New research examining theories how this planet could end up in such a distant orbit finds that most scenarios have low probabilities. 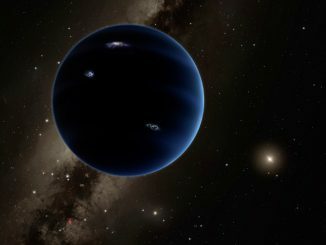 Therefore, the presence of Planet Nine remains a bit of a mystery. NASA’s New Horizons mission has found evidence of exotic ices flowing across Pluto’s surface, at the left edge of its bright heart-shaped area. New close-up images from the spacecraft’s Long-Range Reconnaissance Imager (LORRI) reveal signs of recent geologic activity, something scientists hoped to find but didn’t expect.